Hi Brian, did this method (GE to 3DS Using 3D Ripper DX) work first time around for you? And what was the file size of the 3DR it created? I'm getting 3DR files out (and DDS files) but when imported in Max9 or 10 the scene is empty. I'm trying to establish if the 3DR files aren't good at all or if it's an issue on the Max import side. My 3DR's are only a meg or two capturing the Cape Town city center, so if you say yours were 20megs then I know something's wrong somewhere. Thanks. If the files are being created and they have a filesize more than a few kbs, then I would say it definitely worked (the model files are just text, so even one megabyte is ALOT of coordinates instructions). So you are close. The last step is selecting everything in your scene, and scaling it up a ridiculous amount, even though the scene looks empty, it is not. Follow this part of the video very carefully (selecting the hidden geometry, etc). I have a document somewhere that I've been working on that breaks down the video instructions better, providing recommended settings, etc. Just havent had time to work on it in awhile. Maybe in the next few weeks I'll get it posted. Hey Brian, what version of GE are you using? I am using the newest, 7.1.2 and GE crashes upon launch. I had a successful attempt with 6.0.2 (something like that), however, the 3d in the newest version is incredibly more detailed. Any luck with newer versions? So long as GE is running in DirectX mode, I wouldn’t think there would be an issue. But I have not tested the latest versions, or recently, any version at all, so I would just be guessing. Wish I could offer more here, I just dont have the time to test it now. 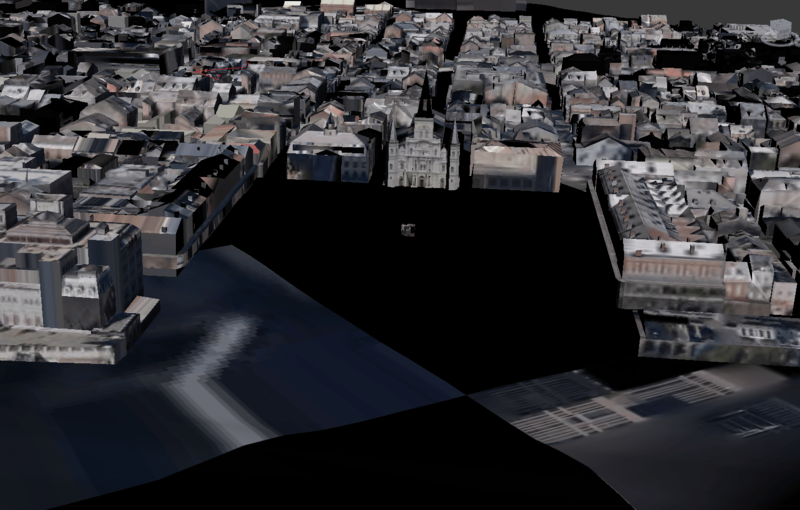 Emmet, what version of Google Earth did you get 3dvia to work with? Also what version of windows? Hey I was wondering if Someone could upload the files from the Paul Fatkins Video? His links on his youtube are dead. Hey Brian, I haven´t been able to make it work on GE pro 7.1, do you know any workaround I could do? I really need to rip it for a school assignment I got. So long as GE is running in DirectX mode, I wouldn’t think there would be an issue. But I have not tested the latest versions, or recently, any version at all, so I would just be guessing. Wish I could offer more here, I just dont have the time to test it now. I would suggest trying earlier/non-pro version to rule out which if any version DO work. Hi, when i press the button "Launch" in the dialog box of the "Ripper" Google Earth starts, but thats it. I cannot export geometry and the yellow button in the left top corner is missing. Could be a lot of issues… Hard to say without knowign your environment. Running a windows VM on a mac? Try other/earlier version of Google Earth? Running in DirectX mode? Have graphics drivers updated? Onboard graphics card vs a dedicated/decent Graphics card? Can you provide more details about your computer, what you’ve tried, etc? thanks for your answer. I'm working on win7 x64; NVIDIA Quadro 1000M. My drivers and directX are up to date. The Rippert launched GE, but there was no yellow button. I tried the other method you described, but I could only capture .jpg and .png files. On another PC the Ripper terminated the correct display of the data and could not capture anything. Sorry to hear that. Personally, I would reach out to the software developer, and triple check your installation/setup steps. Wish I could help more. I'm working on win 7×64 pro, the graphic card is a NVIDIA Quadro 1000M (lenovo laptop). The onbord garphic is a Intel(R) HD Graphics Family, dind't work either. All drivers are up to date. GE V 5.0.11733.9347 is running in the directX 9 mode. I tried it on several computers, also the older method (OGLE). Once I was able to export huge amounts of .png and .jpg files, but no 3D data. So I'm running out of time and ideas. I've tried 3Dvia printscreen (http://www.3dvia.com) too, but in the end i gut just some of the geometry. It would be greate, if you could help me. Handy little tutorial. I was wondering, and you might be able to help me, is there any way to export the geometry of a specific set of terrain? And by geometry I don't mean buildings, but actual terrain geometry (valleys, mountains, etc). I basically want to rip off the terrain of the Iberian Peninsula. Yep, that should not an issue. By default terrain is exported into the model, unless you disable it in Google Earth. Just check out the Google Earth options. You should be able to disable 3D buildings and just leave the terrain. Would you know of a method to get the entire earth exported as some 3d model, ideally at some specificied zoom level? While this is an interesting idea, it is also impossible. Maybe in 10 years? Check back then! That's unfortunate. I wanted to get a 3d model of the earth that would have the perspective of flying over the surface. Most models are looking at Earth from space; hence my interest in exporting Google Earth. i tired it with GE 7.1.2.2041 and the injection of dxripper is not possible anymore. can u please tell us your version? its the most important information regarding this topic…but somehow you hold it back? I held this back because I did not test any other version of Google Earth. The point of my post was not to test ever possible version. I should have included the version I was using however, sorry about that. But it looks like you figured out which versions work though. Thanks! Based on other user comments, this only works on older versions of Google Earth, namely Google Earth 6.x. this was my last enty, still looking forward to your anser. I'm working on win 7×64 pro, the graphic card is a NVIDIA Quadro 1000M (lenovo laptop). The onbord garphic is a Intel(R) HD Graphics Family, dind't work either. All drivers are up to date. GE V 5.0.11733.9347 is running in the directX 9 mode. I tried it on several computers, also the older method (OGLE). Once I was able to export huge amounts of .png and .jpg files, but no 3D data. So I'm running out of ideas. I've tried 3Dvia printscreen (http://www.3dvia.com) too, but in the end i gut just some of the geometry. Hi, I am a mac user, so this tutorial doesn't work for me . . . is there anyone who wants to help me? I want a portion of downtown Paris. Specifics can be discussed by PM (arnold at tyse dot nl) I am willing to pay for your expenses! Hi Arnold. Sadly, I am not able to assist you with this. I can only offer that someone else in this thread may be able to assist you in your efforts. Best of luck! Hi Brian, thanks for sharing your knowledge! 2. when I pressed the F12 key nothing happened and also all the folders (Frame etc) are empty. Is this behaviour related to the fact that I didn't install the 3dsmax plugin? Can you suggest me any solution to finally export the 3D scene? I couldn’t tell you.. but from my experience, you need GE v.5.x. It’s been a long time since I experimented with this (a few OS formats ago). So unfortunately, I can’t offer much more on this. I hope you figure it out though! Good luck! Im pretty sure you need to use GE version 5. Beyond this I can only offer that you re-read this post, and the related posts at the bottom, including user comments. It’s a tricky setup, and user experience will dramatically vary. Good luck! I've read this post and your old one with the GLIntercept, tried both, but no luck so far. I've tried multiple versions of Google earth including 7.1, 5.1,5.2 and 6.2 based on the comments on this page. I've tested your GLIntercept confi with a separately compiled OpenGL app and it does work with that, but not with Google Earth (any of the aforementioned). I did middle mouse click the scene before and tried to press Ctrl+Shift+F as fast as I could before the texture were loaded, but it doesn't seem to work. I've also tried 3D Ripper DX but no joy either. I see "Ready to Capture" yellow text in the top left corner, but nothing happens when I press the Capture keyboard shortcut. I've also tried to remap the shortcut from F12 to F2 just in case but nothing changed. My current setup is Windows 8/GE 6.2/3D Ripper 1.8 (latest available). Any hints/tips will be helpful. Thanks! Sounds like you’ve tried quite a bit. My only thoughts on this would be to ensure GE is not in Program Files (x86) directory. Versions 5.x are the only ones I know that should work – the dll files are in the main GE directory. Also, I never tried this with windows 8. I’m not entirely sure that it will work, as described here, using that OS. Wish I could offer more. Best of luck to you! Hi ,I could successfully install everything and the yellow button is available but actually I can not have the capture bypressing the f12 and did not get your explanation of clicking on top view and go to 3d.do you have any suggestion? Its a difficult thing to describe, but my experience was you needed to ensure GE was the active window right before the capture… I did this by middle mouse clicking on the title bar of GE right before clicking on GE. Keep at it, you’re close! Thanks for the instructional video, works great. Oh, I see the yellow indication, ready to capture in 6.02, but not in 7.1 and 5 version. I struggled to get it for two days and Now it works. I think I tried this awhile back and had difficulty with the texture mapping, but for those smarter than myself, definitely a good alternative! Hello, this post is great, it is exactly what I'm trying to do. So I've faced the problemes you guys faced already with the newer versions of google earth. But I can't even seem to find a link to download the instal for google earth 6.2 as it seems to be a working version… anyone have a clue on where I could find it? Thanks! Sorry my browser crashed and I didn't finished my message. Can you remove it? Hi Brian! I have tried to use this method multiple times but i never achieved any result because my 3DStudio Max doesn't display the imported model. I can get all the steps right to the import, but when it imports i get's no errors but simple i can't find the model. I am working in an architecture project, any help and i will be very grathefull. Thanks for the heads up! Post updated. Is the 3dripdriver.sys file that 3D Ripper DX tries to install safe? My virus scan program is blocking it. Also, the install is now behind a password (which they give you during install), which makes me wonder if someone repackaged a virus into the installer. I downloaded it straight from the website you linked to. Anyone know of any leads for how to export Google Earth Pro v7 into rhino with 3dripperx or similar apps? Hi Jeffrey, theres no way can do it. hey fahad did you install max before installing 3dripper? I've been fighting with this over and over and i keep getting a bit closer to it. I wasn't sure where to put the plugin so i installed 2009 first, the 32 bit version, the 64 bit won't show the 3dr import option even if i told 3dripper to install it. It wouldn't install it for 2011 either so dunno. the yellow "ready to capture" shows up but f12 does nothing. Just pan around a bit then press f12 again, keep doing that till it works. Tested in 3ds max, maya, and c4d same look, importing data but, meshes don't look like google earth geo. Also Google earth is launched direct V mode from 3D Ripper DX looks like it has 1. no textures 2. other UI elements are just blocks of solid colors.